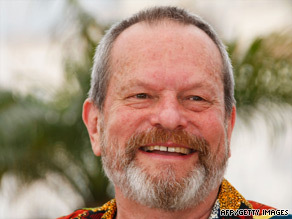 Is there a filmmaker in the world with worse luck than Terry Gilliam? He was directing Heath Ledger in "The Imaginarium of Dr Parnassus," when the actor died — and it’s not the first time he has lost a leading man. TG: All films are learning processes. I am still trying to work out how you make a movie. I didn’t study at film school or any of those things I didn’t bother with film theory. Mine is the Mary Poppins theory of film — a bit of sugar helps the medicine go down. And I have always got medicine I want to give to people. TSR: Which film are you most proud of TG: “Brazil” is the on that will probably be stamped on my grave because that on seemed to have made a big effect on a lot of people. And that’s all I’m trying to do is affect people. TSR: What have you learned over the 30 plus years you have been making films TG: There is no one thing — it’s just going through life. I don’t’ think you ever learn just one thing. At some point you start unlearning things. I have been working hard to unlearn everything I know. TSR: Where are you with “Don Quixote” TG: “Quixote…” It’s been almost eight years since it fell on its little face. We had been trying to get the script back from the legal entanglement it was in … and finally pulled that off. I had in those intervening years never read the script because I knew it was the best thing I had ever written. It was perfect — I finally did it. I got it back and re-read it and have now been busy re-writing it. TSR: What advice would you offer to aspiring filmmakers TG: Talent is less important in filmmaking than patience. If you really want your films to say something that you hope is unique, then patience and stamina, thick skin and a kind of stupidity. A mule-like stupidity is what you really need.